Friday was the day I had targeted as the highlight of SXSW 2010 and I am happy to report that it did not disappoint. My plan was the Hear Ya Day Party at the Beauty Bar, mayne a little Canadian BBQ in the afternoon and the traditional Friday night show at South by San Jose with the Alejandro Escovedo Orchestra. We got downtown around 12:30 and there was music everywhere under a brilliant blue sky. It truly is a scene that has to be seen to be believed. Walking the three blocks to the Beauty Bar I passed at least 10 other parties going on! 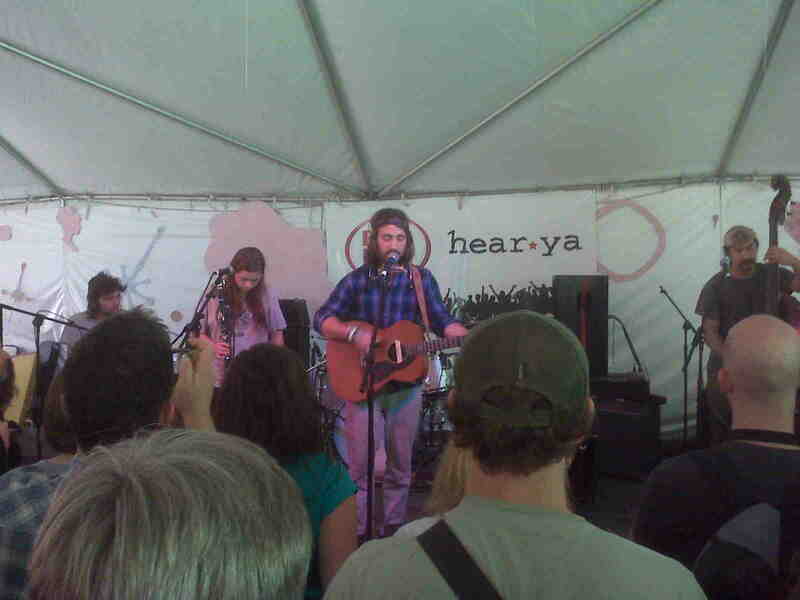 Opening up the Hear Ya show were The Deep Dark Woods - unfortunately by the time I got in they were just starting their final song. I will have to check them out some more in the future as it sounded good. Next up - The Mother Hips. My pal Shug is the biggest Mother Hips fan in the world (see his website listed here - Sugartown) and I had seen them last year but was not sold on them. Not sure if it was the setting this year (the party tent held about 250 people) or just a better setlist but they were great. I definitely liked the songs and they seemed to really enjoy playing this set. I need to see a whole show of theirs now and pick up a couple of CD's for the collection to know their music a little better. Next up was Lissie and I have to be honest I had never even heard of her. 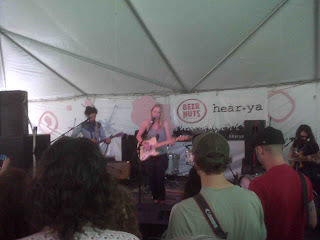 By far the biggest surprise of SXSW for me was this 21 year old from Rock Island, IL. I thought this was going to be a dull singer songwriter but she plays some great music. She is still developing her stage presence but she is a fantastic singer and I will be picking up her CD in the very near future. This is somebody to watch for the next couple of years. She played a great 5 song set (everybody got 25 minutes at this party) and was playing a full set later that night but I knew it was probably going to be too late and too hard to get in. I will definitely be looking for her next time she comes through Austin. 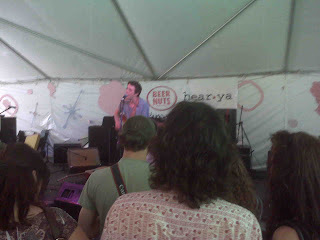 Joe Pug was on the stage next. I had seen him open for Steve Earle in Chicago last summer but we only caught the last two songs of his set and it was in a pretty big place so it was hard to tell about a guy and his guitar when you didn't know the songs. 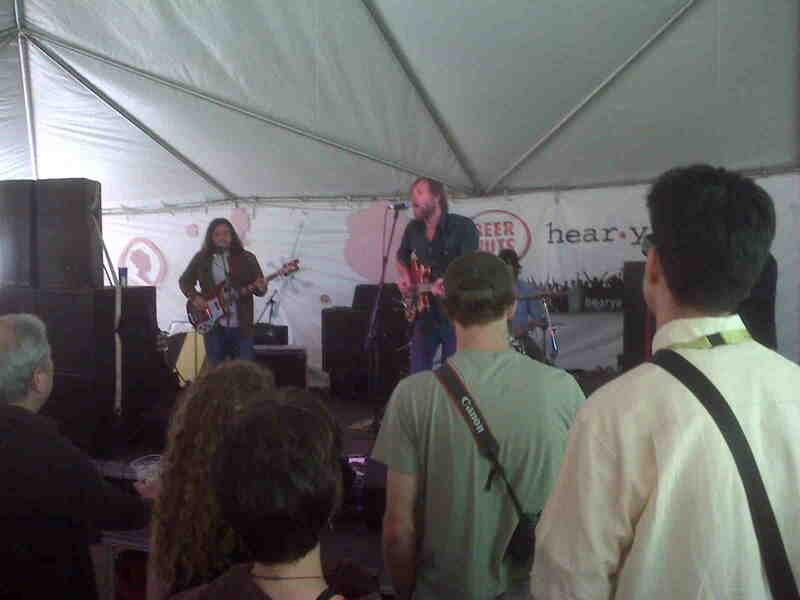 Joe had to be one of the hardest working guys at SXSW this year - something like 11 different sets! He plays some great songs, sings with real conviction and has great stories in his songs. I would love to see how good the songs could be if he had a band playing behind him. His story is pretty interesting as well - a guy just trying to make it by working hard - as he said - "Living the Dream". When Joe was finishing up he made the comment that The Low Anthem was up next and that they were the best f***ing band in the land. High praise so I wanted to see if he was right. And wow was he right. I have had The Low Anthem's "Oh My God, Charlie Darwin" for quite a while and really like "To Ohio" but the Anthem in person is not even close to the record - and in a great way. The foursome plays a different instrument on nearly every song. How you can go from playing bass to drums or clarinet to guitar I have no idea since all I can play is the Ipod! Lead singer Ben Knox Miller has the rock star look and seems to be very comfortable as the front man - during sound check he said "that's close enough"! After opening with three slower songs that had great harmonies (just like on OMGCD) they rocked the last two songs. That five song set sold me and left me wanting a longer set and sooner. Unfortunately their SXSW showcase was at 12:30 AM Saturday Morning - I'll just have to wait for them to swing through Austin again. It was now approaching 3 PM and all I had for the day was a fine Coca-Cola Classic product so it was time to look for food. I had a plan to try and get into the Canadian BBQ at Paradise on 6th since Sass Jordan was performing at 5 PM. I know her through my boss who gave me a copy of her CD last year. I got to Paradise and found out the BBQ was upstairs and everybody was welcome. And better yet there was a mexican buffet with great enchiladas - beef and chicken. You can't beat that for free. While I was sitting there eating the whole group started texting me to see where I was since they were looking for some food too. Within 15 minutes 8 of the 10 people staying at our house were eating enchiladas! The Simon Collins band played from 4 to 5 - some traditional rock and roll. Sass followed up on that and her voice in person was just as good as on the cd. All the kids at that point decided to head for some house party a few blocks away where Zeelander P from Japan was playing. Or as they called them the Power rangers since they wear some funky plastic looking suits - 20 something's are easily entertained! I headed off to South by San Jose and since it was such a beautiful day I decided to walk the 15 blocks and cross Lady Bird Lake to South Austin. I got to the Hotel San Jose parking lot around 6:15 and Adam Green was playing. The first thing I heard was him complaining about how bad his life was that he was playing a half filled Hotel parking lot. And less than 5 hours earlier I had heard Joe Pug say he was living the dream and his crowd was probably smaller! Attitude is everything. This Adam Green was playing some music but mostly talking and then the power went out once. It came back on and he was rambling more and then the power went out for good and he left the stage with his band - guess the music gods were sick of his rambling too! Once we got rid of that character Amy Cook was up next. We like Amy a lot ever since we met her at KGSR when Tift was in town as they are friends. She has a new CD, Let the Light In, coming out later this spring produced by Alejandro and I am looking forward to that. She played several of the new songs and she has a couple of potential airplay songs it seems. She was joined by the Tosca String Quartet which really adds to her sound and later by Alejandro's guitar player David Pulkingham. She is someone you might want to look for later this year when she is out promoting her new disc. Darkness was about to set in now so there are no pictures from Alejandro's set since they don't really come out with all the lights. By now 4 of the kids had joined us as the Power Ranger's show had lost their interest when they found the house concert was in the backyard - and there was a goat in the front yard and a cooler for help yourself beer at a $1 a can! Only in Austin during SXSW. Alejandro has been putting together a rock and roll Orchestra for the last few years for the Friday night show. He really has become the king of South Congress with this show as well as his Continental Club show on Sunday night to close out the week. This year's orchestra wasn't as big as last year's as the strings were missing. One of the things Jo and I have enjoyed the most in seeing him a few times in the last couple of years is the sound that a cello and violin add to a rock and roll band. 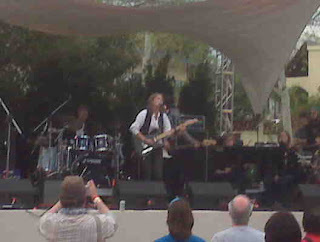 But I have heard that on his new CD also out this summer he is going back to a basic rock and roll sound. His set opened with "Always a Friend" and even after two years of hearing this song it's still a great song to me - and not just because he played it with Bruce and the E Street Band in Houston - it really is a classic rock and roll song. Later in the set he dedicated "Sister Lost Soul" to Alex Chilton who had just passed away on Wednesday. After this he launched into the new material - 9 songs in a row off of the new disc. Not exactly the way I would have written the setlist - mixing in old and new would seem to have kept the crowd into the set more. By the 5th or 6th song people were starting to leave. Take a note from Bruce and mix old and new and everybody stays happy and interested! After the new songs we got Chelsea Hotel '78 and it was time to go. A high energy set as always but not one of my most memorable shows of Alejandro. At this point we were pretty beat - about 9 hours of music by now. So with Rachael Ray's big party on Saturday AM we headed for the house and some welcome sleep!